Most people like grapes and raisins, because they’re yummy and good for health. Dog owners like to share their foods with the dog, they always think their foods are good for dogs too. But not all, grapes and raisins are bad for dogs! They’re fatal for dogs. The consumption of grapes and raisins are potential dangers to your dogs. Even a few grapes or raisins could take fatal toxicity for dogs. They can cause acute renal failure with a lack of urine production. The Animal Poison Control Center (APCC) first reported The toxicity of grapes to dogs. But the reason that grapes cause the toxic reaction is not yet known. The dogs who ate the grapes and raisins would vomit and get the runs within the first few hours. You may find small broken pieces of grapes or raisins in the vomitus or excrements. For more severe cases, dogs will be unusual quietness and weakness, not eating and abdominal pain. These symptoms will last several days even weeks. Acute renal failure develops within 48 hours of ingestion. If your dog eats grapes or raisins, you must induce vomit before absord the toxic substances. We recommend you take the dog to a pet hospital, because there isn’t hydrogen peroxide or apomorphine to cause the dog to vomit at home. If the symptoms get worse, you must be hurried to a pet hospital immediately. 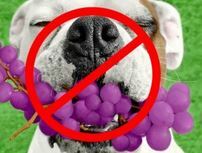 Don’t let your dogs eat grapes or raisins! Keep your dogs keep far away from them.